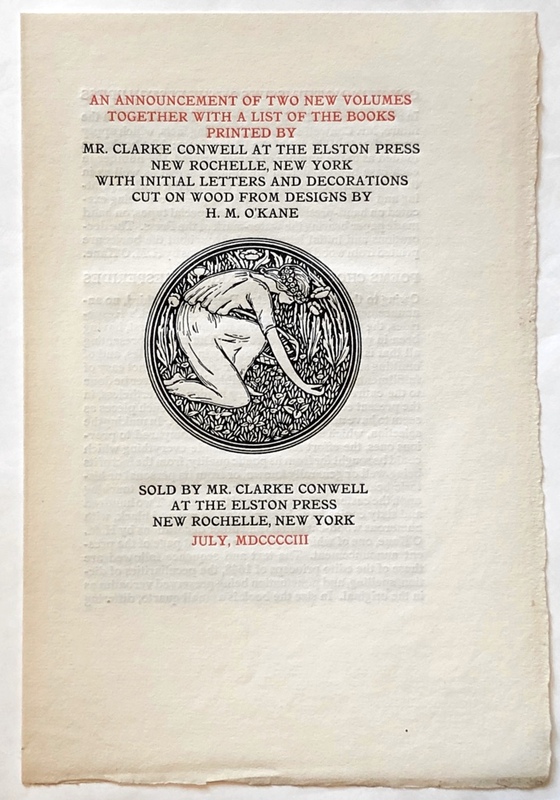 In answer to repeated inquires and to forestall such in the future, Mr. Conwell states the following facts, which apply invariably to all issues of the Elston Press: The books are limited as to the number of copies printed, the number in each case being stated in the announcement as well as in the colophon of the book. Every detail of the work of printing and binding is done by hand, the presswork being executed on hand-presses directly from special types, on hand made paper bearing the water-mark of the Press. The decorations and initial letters used throughout the books are printed from wood blocks cut from designs by H. M. O'Kane. 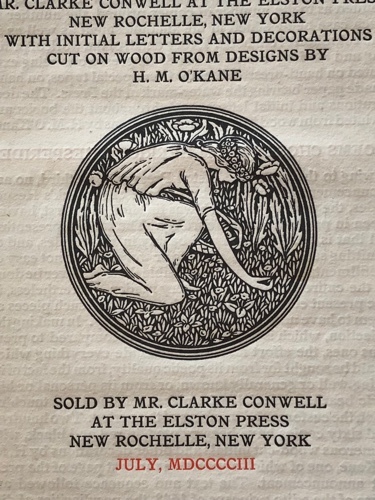 Owing to the fire at the Elston Press on May third, no announcement has hitherto been made of Herrick's Hesperides, the printing of which was finished May first, having been in progress since February. The task of presenting all that is best in worth and beauty in Hesperides, and of omitting such as is uninteresting or worse, is one not easy of fulfillment, and it is scarcely possible that it can ever be done to the entire satisfaction of every reader. Nevertheless, in the present edition, there have been o9mitted such pieces as seem to have no genuine claim to perpetuity. In making the selection, which is unusually liberal as compared to previous ones, the effort has been to include everything which could be sought for from its poetic quality, from the fact of its being well or generally known, or from its personal or historic bearing, especially the pieces relating to or touching upon the customs and manners of the period. 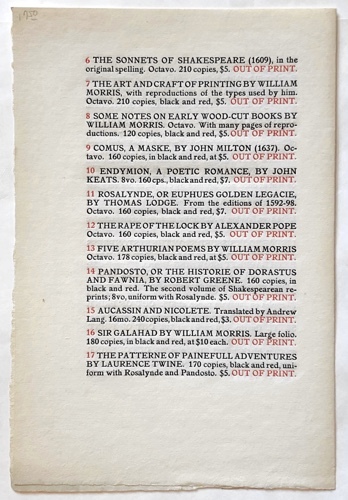 Two hundred and sixty copies have been printed, in red and black, with numerous wood-cut initials and other decorations by H. M. O'Kane, one of which appears on the first page of the present announcement. The text and sequence followed are those of the edito princeps of 1648, the peculiarities of diction, spelling, and punctuation being preserved verbatim as in the original. In size the book is a small quarto, differing somewhat in shape from the previous issues of the Press. The price is seven dollars, carriage paid. 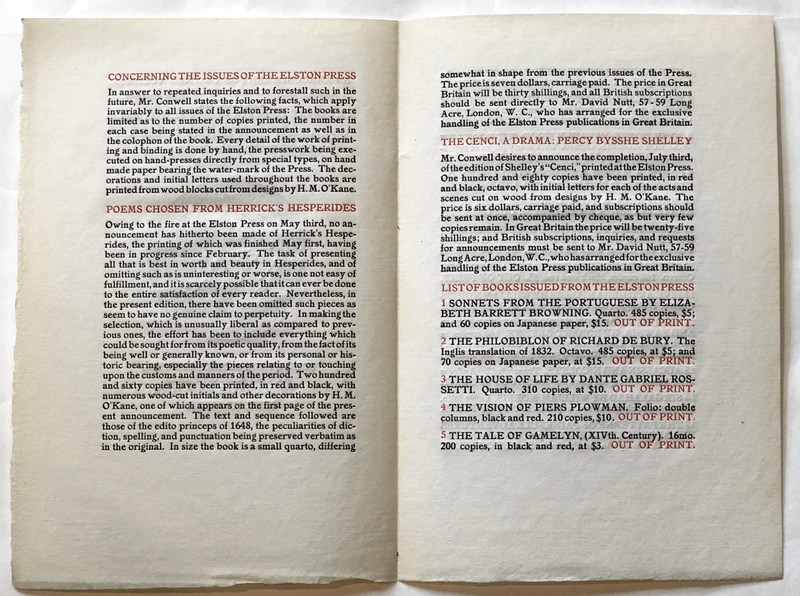 The price in Great Britain will be thirty shillings, and all British subscriptions should be sent directly to Mr. David Nutt, 57 - 59 Long Acre, London, W. C., who has arranged for the exclusive handling of the Elston Press publications in Great Britain. Mr. Conwell desires to announce the completion, July third, of the edition of Shelley's "Cenci," printed at the Elston Press. 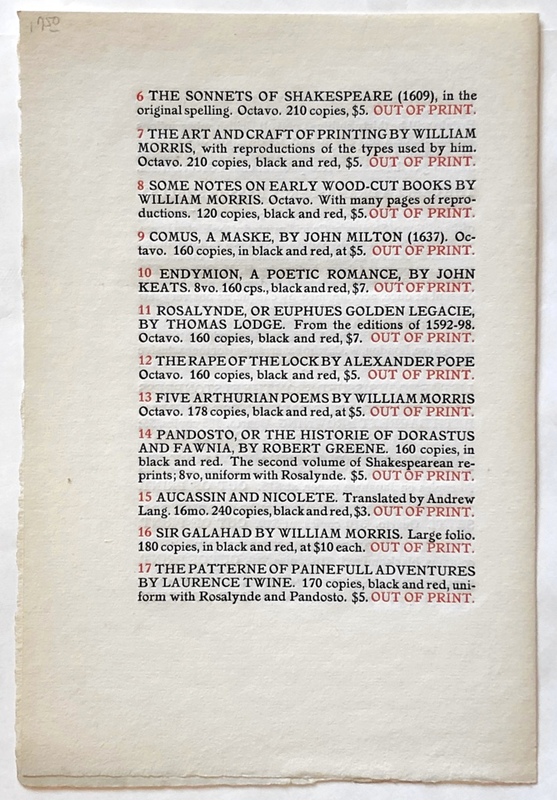 One hundred and eighty copies have been printed, in red and black, octavo, with initial letters for each of the acts and scenes cut on wood from designs by H. M. O'Kane. The price is six dollars, carriage paid, and subscriptions should be sent at once, accompanied by cheque, as but very few copies remain. In Great Britain the price will be twenty-five shillings; and British subscriptions, inquiries, and requests for announcements must be sent to Mr. David Nutt, 57 - 59 Long Acre, London, W. C., who has arranged for the exclusive handling of the Elston Press publications in Great Britain. 15 AUCASSIN AND NICOLETE. Translated by Andrew Lang. 16mo. 240 copies, black and red, $3. OUT OF PRINT. 16 SIR GALAHAD BY WILLIAM MORRIS. Large folio. 180 copies, in black and red, at $10 each. OUT OF PRINT. 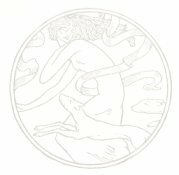 17 THE PATTERNE OF PAINEFULL ADVENTURES BY LAURENCE TWINE. 170 copies, black and red, uniform with Rosalynde and Pandosto. $5. OUT OF PRINT.